When your pet is restrained, their risk of injury decreases dramatically — if you need to stop suddenly, your dog won’t go flying. Many pets are injured each year when their owner stops suddenly and they are projected forward, hitting the back of a seat, or worse, the windshield. Also, if you’re involved in a crash, the restraint helps keep them from getting injured and even from running away from the scene, since they’ll be scared.When belting your dog in, doing so with a dedicated travel harness, as opposed to just clicking in their leash attached to their collar, is the far safer option. If secured by their collar, there is a serious risk of strangulation (or even worse) in the event of a sudden stop or a crash. And, because of the airbags in the front passenger area, it’s best to keep your pup secured in the backseat or cargo area to prevent injury or death that can be caused by the passenger airbag. Unless your vehicle lacks a front passenger airbag or you can temporarily disable it, it’s best to keep your pet in the back of the vehicle. Look for restraints that have been certified crash-tested by the Center for Pet Safety (CPS) to ensure that your pet will stay as safe as possible in case of a crash or sudden stop. 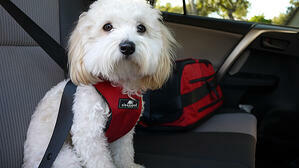 There are many types of restraints for your vehicle, so you can choose the right one for your vehicle and pet. These are harnesses for dogs designed to be worn in the car, though some are also effective and comfortable for short walks at your destination or while en route. Look for one that has either been crash tested or has otherwise been subjected to the forces that it claims to withstand. Sleepypod harnesses, like the Clickit Sport, received top marks from CPS crash tests — and (bonus!) can also be used as everyday walking harnesses for your dog! These are open seats that either rest on your vehicle’s existing seats or are suspended above your existing seats by straps that attach to the existing seat back. These can be a good option to elevate smaller dogs so they can see easily out the windows. (That said, if your smaller dog does well in an enclosed carrier, like one of the ones recommended below, those are typically a far safer option.) Many of these pet booster seats include tethers that can be attached to your pet’s harness to secure them (again, don't attach these straps to their collar). If your dog weighs 30 pounds or less and does better when they can see out the window (and so therefore wouldn't do as well in an enclosed carrier), a booster seat combined with a harness can be a good option. This booster seat takes a little work to put together, but it stays securely in place by attaching to your vehicle's seatbelt. Your dog is restrained to the seat with an included tether that attaches easily to your car's seatbelt and a harness, like the Sleepypod Clickit Sport. Carriers are an excellent and safe way to transport cats and smaller dogs during travel, as long as the carrier is belted in, strapped down, or otherwise secured in the backseat or cargo area. They exist in both hard- and soft-sided options, and many have a built-in way to secure the carrier in your vehicle. There are many excellent carriers out there on the market for you to choose from. 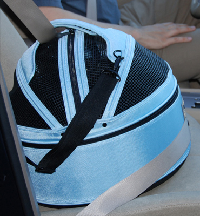 A few of particular note are the Air carriers by Sleepypod, and the Comfort Carrier by Bergan. The Sleepypod has been crash tested – safe, easy to use AND stylish! These can also double as a way to travel with your pet in the cabin of an airplane. This hard sided carrier by Amazon Basics has two doors, including one on the top which allows for easy loading and unloading of your dog. 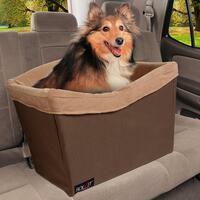 Its lightweight and durable plastic construction makes it safe, secure, and comfortable for your pup on road trips. Make sure to secure the crate to your vehicle with straps like these. These barriers can improve safety by keeping your dogs out of the front seats and by preventing them from getting into toxins and other hazards in the front of the car. 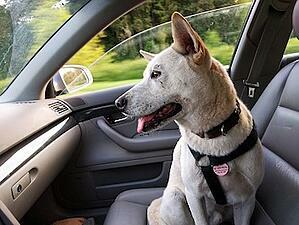 However, these barriers alone typically will not keep your dog safe in case of a crash. 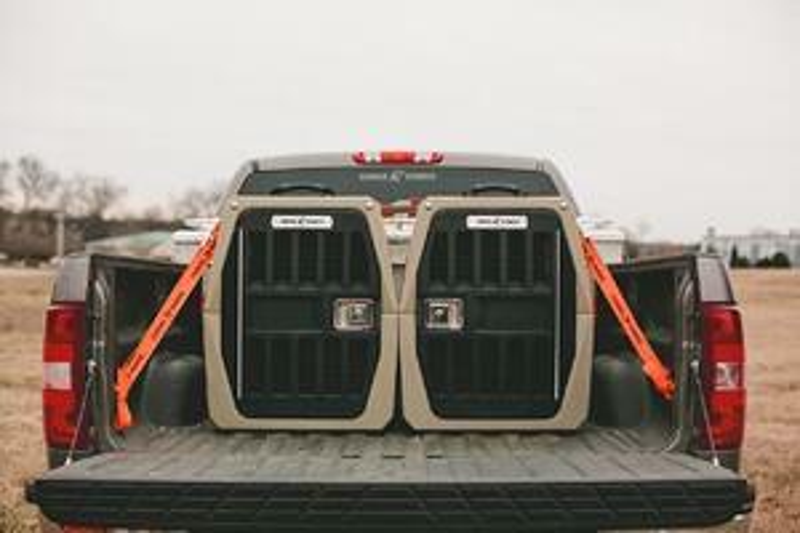 If your dog is used to traveling behind such a barrier, consider securing your dog in the cargo area through the additional use of a crate or travel harness. Many vehicles these days have the top LATCH anchor points on the back of the back seats, a carabineer tether (such as that on the Bergan) or one of the LATCH specific tethers can be used to attach to it. For those cars without the LATCH anchors, you can secure the tether to a sturdy metal cargo area tie-down. Crates are a great option for larger dogs who do not tolerate being in a safety harness, and are an excellent option for dogs riding in open beds of pick up trucks (so long as the crate itself is secured to the truck bed and immobilized to prevent it from tumbling or being thrown from the truck). Like carriers, crates can be either hard- or soft-sided. There are, of course, benefits and drawbacks to both types — the ultimate decision of which type is better is dependent on personal choice and a few important factors (desired strength, portability, air flow, and certain other criteria). It is important that the crate you choose can be easily and effectively tethered to the seat or cargo area when transporting your dogs. Though they're quite pricey, crash testing done by CPS showed the Gunner Crates to be the best. You can use kayak straps or other tie-downs, but your safest bet is to use proper kennel tie-down straps, like these Gunner Kennel straps. Bungee cables are not a safe option to tie down a crate. Pickup truck beds are a popular spot for dogs, especially during warmer months. But, they are a dangerous spot for dogs if they aren’t secured properly — and so often they aren’t secured at all. A dog that isn’t secured properly is likely to jump or be thrown from the bed, causing serious injury or death. A proper tethering system and cross tie attached to a harness is the safest way to secure your dog in a truck bed if you choose not to use a crate. The harness piece is important, because attachment to a collar is certainly not safe, and it’s often ineffective, too. Many dogs have been hung when they jump or are thrown from the back of the truck when restraint has been attempted through the use of a leash and collar. Even if you’re unable to afford one of the CPS certified restraints, having your dog restrained in the car in any way is better than not at all. But, keep in mind if you want to ensure the best level of protection in a crash, go with a restraint system tested and certified by CPS.